VRT-10 is a microprocessor based voltage regulator tester. The unit can automatically test with PASS & FAIL indication all types solid state voltage regulators 12 - 42 Volts. 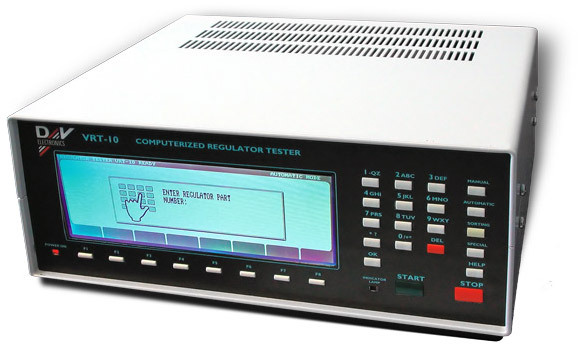 For precise regulator testing, the altenator's internal signals and the vehicles input and output signals are fully simulated and measured. For high speed testing, the VRT-10 has an optional pneumatically operated connection fixture. The tester can verify assorted special functions on the regulator, such as SSD, LRC,computer controls etc. The VRT-10 can simulate energizing of the alternator for TOS comparison. The operation of the alternator and regulator is completely digitally simulated and controlled. The tester has a built-in short circuit protection. During the test, measured results and diagnostic messages are displayed. The Sort function is a powerful time saving tool indicating what regulator is it and is it good?